Tax Workshop for Freelance Musicians, Artists and other Creative Professionals! Join us on March 10th at 6:30pm at Mayday Space in Bushwick to discuss everyone’s FAVORITE topic: TAXES. For this workshop, Orion from Brass Taxes and Katherine Powell independent artist/venue manager, will be joining us to go over how to keep track of expenses throughout the year, what is and is not important, and how to make sure that you are planning correctly for the taxes you will owe each and every April 15th. There will be a 75-minute presentation followed by time for questions. SOCIAL CLUB "Party on Avenue C"
SMC Social Club is a monthly party hosted by the Sound Mind Collective, a group of your favorite NYC independent musicians exploring our collective power in pursuit of a more sustainable, independent and community-oriented local music culture. Come groove with the SMC crew over drinks and killer tunes! Join us for the February 2019 general meeting of The Sound Mind Collective!! *see below for info about DONATION ITEMS! The Sound Mind Collective is setting off the holiday season the right way-- with music and the spirit of giving. We've brought together some of Brooklyn's finest musicians to support two great causes: The Urban Resource Institute and NYC Books Through Bars. URBAN RESOURCE INSTITUTE provides resources and social services for people suffering or recovering from domestic violence. All donations will be sourced to local organizations through out New York City and outer boroughs. *STAMPS: Books Through Bars is always in need of stamps. We highly encourage everyone to consider donating stamps in addition to. They should be bought in values of $2.66 $3.17 $3.68 to be most cost effective. BOOKS THROUGH BARS NYC, which distributes free books to incarcerated people nationwide. Every independent musician stands to benefit from good PR, but it doesn't always make sense to risk spending thousands of dollars on a publicist that may or may not get good results. Join us for the SEPTEMBER meetup of The Sound Mind Collective!! • Developing a platform for the music community to present to the newly appointed NYC Director of Nightlife and other government officials who serve the arts community. 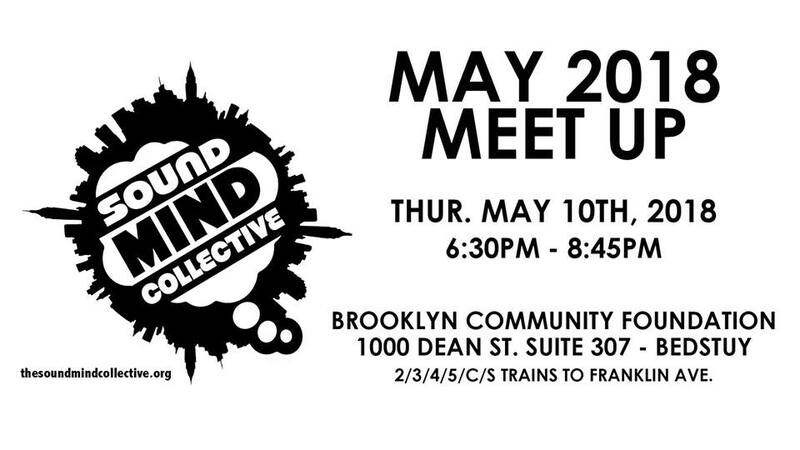 The Sound Mind Collective is an organization based in Brooklyn, NY devoted to connecting independent musicians and artists with our local communities to encourage meaningful positive growth in education, social justice, and creation. We are also focused on providing resources for independent musicians and creators in areas of basic business management, with the greater intention of strengthening our music community in ways that are more socially conscious and self-sustaining in the face of an increasingly corporate music industry. On Wednesday, December 20th, The Sound Mind Collective presents Uplift! Brooklyn, an evening of comedy and music raising money for the EXALT Youth Program. The show will be hosted by comedian Carolyn Castiglia (Comedy Central, HLN) and will feature musical performances by Qaasim & The Juggernaut War Party, Mr. Reed, and Wishes and Thieves. The booking process for independent musicians can often be confusing, demoralizing and overwhelming. The Sound Mind Collective is hosting a conversation and workshop on the booking process for independent artists. We will start with a conversation about general booking strategies and share our experiences with local booking and national touring, before moving into workshop mode: directly sharing booking contacts, reviewing bios, developing booking inquiries, EPKs, and more.